My knowledge of authentic Chinese cuisine is limited but that does not prevent me from experimenting with various Chinese ingredients. One of my favorites is sichuan peppercorns. I still remember my first sichuan meal: more spicy than I had expected but what a meal! Spicy beef short ribs, chicken with green beans, and bean sprouts in a spicy broth. Since that delightful induction, sichuan cuisine is now high up on my list of ethnic indulgences. The two main elements of sichuan cuisine are chili peppers and peppercorns. 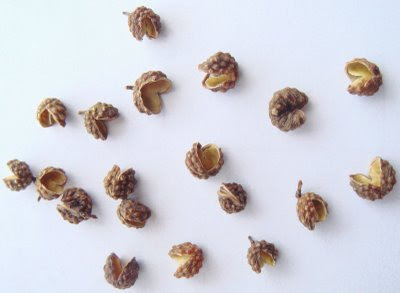 Despite its name, the sichuan peppercorn itself is not spicy but imparts a tingling, numbing sensation on the lips and tongue. With quite a unique aroma and taste, these tiny pods have an overtone I can only describe as similar to the aroma of lime leaves. If used in excess, the taste can be overpowering, especially in a mild bean soup such as this. When I first made this recipe, I added a teaspoon to the beans while they softened and a teaspoon to the mushrooms. Instead of a bean soup, it tuned out to be a peppercorn soup, with a taste that was almost medicinal. Ultimately, a single teaspoon was just enough to impart the desired level of sichuan flavor . 1. Wash and boil black eyed beans in two cups of water until fork tender. I prefer using the pressure cooker for this as it softens the peas in about 10 minutes, as opposed to traditional boiling which can take up to half an hour. Drain and set aside. 2. Heat a stock or other deep pot over medium heat. Toss mushrooms with garlic and oil. Saute with peppercorns for five minutes. Stir in vegetable broth and cooked beans. Cover, reduce heat slightly and simmer for 12 to 15 minutes. 3. Whisk egg separately, pour into soup, quickly stir to distribute and remove soup from heat. 4. Serve immediately with small pieces of chopped fresh green chilli. That soup looks very delicious!! This soup sounds marvelous. I've never used sichuan peppercorns before - this would be a good time to start! I love the the numbing effect of peppercorns! Thanks for visiting everyone! I hope you guys get to try this exotic tasting recipe. I want to drink with spoon. This soup seems so scrumptious. 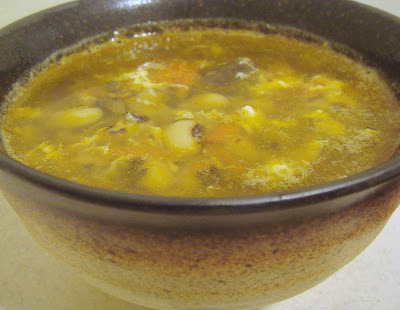 I make mushroom soup (http://www.giverecipe.com/creamy-of-mushroom-soup.html) but I haven't tried cooking mushroom and beans together. Great idea!! Thank you so much for this warming soup. Thanks for your comment kalpanakasupa12. Zerrin, I think you will be pleasantly surprised to find that beans and mushroom go well together. Hope you make this one day.